Building Our Own Board Games. This is Star Wars Saves the Princess. With only a few days of school left, we weren’t sure that we wanted to begin a new unit. Insects and silkworms are still intriguing, but after many weeks, we’re running out of project ideas. Enter three students and the Amazing Carnival Ring Toss Game. 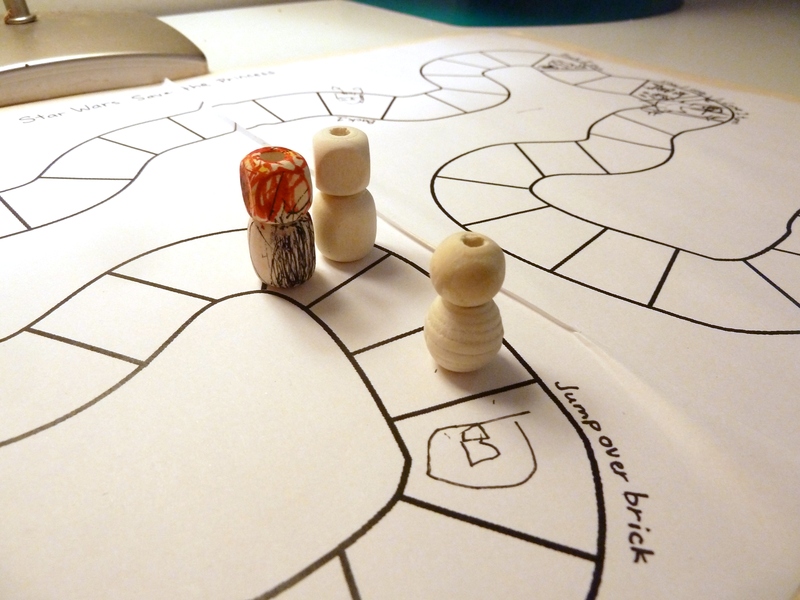 One day, following centers, these two scooped up the available bits and pieces and created a brand new game. Using a piece of yarn to designate a throwing point, one student stands at the line while two others stand a few feet away. The “thrower” tosses an expanded Venn Diagram Circle in an arc to attempt to “ring” another student. The number of points you score depends on which student you “ring”. Designing this game required cooperation, leadership, innovation, and ingenuity. Rules had to be established, agreed upon or changed, and shared. Design flaws had to be worked out. They found that tossing these collapsible rings wasn’t the easiest chore. Structural changes were made. The first throw line was within inches of on of the “goals”. All of this had to be agreed upon by three players. No small accomplishment in my mind. As usual, Mrs. Pless and I were inspired by what we found the children doing on their own. We were reminded of all of the games we’ve seen children develop both inside and out over the years. It is amazing that though no one ever actually overtly teaches children how to make a game, they are all familiar with the process. We wanted to take the process even deeper and explore what makes something a game. How do you make up a game? Are there any rules that need to be the same in every game? What do you do if you don’t want to play your friend’s game? What do you day if you want to change the game? This week we’re looking to the children for answers to many of these questions.